For those who don’t know, we’ve moved. If you’ve been reading the Philly Soccer Page via RSS feed these last several weeks, you need to sign up again now that the site has been moved to a different host. Go to http://www.phillysoccerpage.com and sign up there. Once you do that, you should be good. We’ve upgraded the Philly Soccer Page site. If your browser is still taking you here, redirect yourself over to http://www.phillysoccerpage.com. That should bring you to the new page. All our further work will be posted there. If you have any trouble accessing it, please email us via the Contact page above. Ben Tracy did a good job summarizing the US v. El-Salvador match, so I don’t want to repeat. However, I did have a bit more to add. First, I felt that Sacha Klejstan got lucky to score his goal, and that overall he did not play that well. He continued his inconsistency by playing well at some moments and then playing poorly just after. He had two other clear chances to score and was not able to put it away. He also misplaced a number of passes. I don’t think he has gotten back to the form that could put him on the World Cup squad. I love reading about soccer. There are team histories, histories of the game (my personal favorite), statistical almanacs, encyclopedias, coaching guides, photo books and a gazillion, mostly ghostwritten, memoirs, not to mention scores of magazines and countless websites and blogs. While the majority of these reads probably originate in Britain – the printed ones, anyway – this is slowly changing. Finding fiction about soccer, other than books intended for the juvenile audience, can be pretty tough. Soccer fiction by American authors is, so far as I’ve been able to discover, an empty field. So when it comes to funny soccer fiction books the only examples I know are from British authors. Here are some suggestions, three of which are fiction, if you are in the mood for a good laugh. Let’s begin with the obvious. 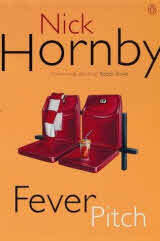 Although it is a memoir and not a work of fiction, it was written by one of the more successful English novelists of the past twenty years at the beginning of his career: Nick Hornby’s Fever Pitch. When it was published in 1992, football in England was just beginning to emerge from an all time low. Hooliganism, decrepit stadiums, stadium tragedies, a ban on English teams playing in Europe were all taking a toll on the game in England. Anyone wondering to what extent goalkeeping can derail an otherwise very good team need only look at Arsenal. The Gunners’ goalkeeping situation reached farcical proportions today after young Polish ‘keeper Lukasz Fabianksi gifted Porto a 2-1 advantage in the first leg of their Champions League tie. Fabianski was filling in for the injured Manuel Almunia, who has been having such a rancid season that there were rumors of an attempted deadline-day deal for Stoke’s Thomas Sorensen. At the very least, many fans have been clamoring for Fabianski to get his chance, thinking he could not be much worse. He got his chance today…and bumbled it into his own net. Zombie Collina has no patience for your diving, Didier. The thirty referees who will handle South Africa’s World Cup matches were announced over the weekend. And yes, “handle” is being used in a punny sense here as Swedish whistleman Martin Hansson is the most controversial inclusion. Hansson missed Thierry Henry’s clear handball in France’s victory over Ireland that secured their place in South Africa, an event we covered extensively at PhillySoccerPage. The full list is after the jump, courtesy of worldcupblog.org. The United States was shut out. Should the MLS be represented? By whom? Another notable inclusion is Roberto Rosetti of Italy, who is routinely assigned to the top Serie A matches and routinely turns in mediocre performances. If there are any Serie A fans reading this, give us your thoughts on Rosetti in the comments. And if you believe that his stellar reputation is built in part on his emphatic free kick gesturing and sprinting to the spot of a foul, just write, “Here, here!” or its Italian equivalent.